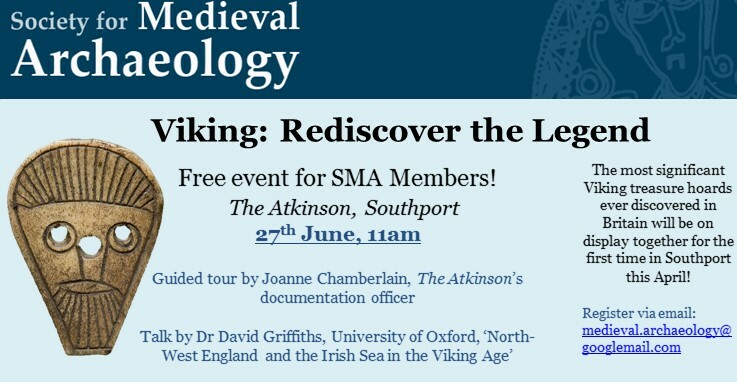 The SMA is delighted to invite our Members to a special behind-the-scenes event at The Atkinson, Stockport, at 11 am on 27th June 2018. The event includes a guided tour of ‘Viking: Rediscover the Legend’ by Joanne Chamberlain, The Atkinson’s documentation officer, and talk by Dr David Griffiths, University of Oxford, titled ‘North-West England and the Irish Sea in the Viking Age’. This is the first time the most significant Viking treasure hoards ever discovered in Britain will be on display together in the North West – don’t miss this opportunity for a behind-the-scenes tour! This event is free but registration is necessary. If you are not a member but would like to attend the event please join the SMA from only £20!